Despite many warnings right in our own community, it is estimated that roughly 200,000 vehicles in Scottsdale, Mesa, and Phoenix are recalled and still in need of an airbag repair. PHOENIX — Just last month, a Buckeye man's death was linked to the Takata airbag recall that has claimed the lives of more than 20 people worldwide. In order to get drivers to take action, The Carma Project was created where users can get paid to alert their friends and family about the safety concerns. "Because everyone...they're busy," said Carma Project President Tony Lim said. "They receive a lot of mail, a lot of junk mail, they receive a lot of calls from numbers they don't recognize." The incentives are funded by Toyota, but all car brands involved in the recall can be involved. It works like this -- people can sign up for account with the Carma Project. Once they do, they can send links via social media and text message to their friends and family. If they use the link, you get $5 in rewards. If they use the link and get their recalled airbag repaired, you will get $50 in rewards. To check if your car is recalled, you just use the account to take a photo. It will then tell a user if they need the free repair and will allow them to call from there and schedule it. The idea is that drivers are more likely to trust friends and family. 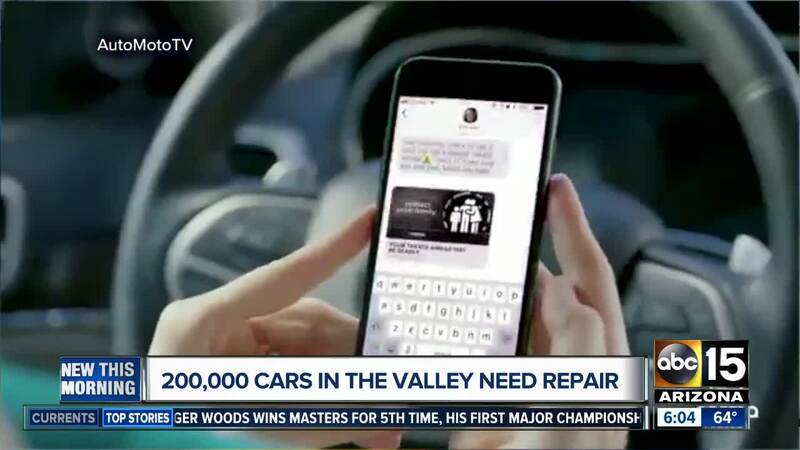 There is a bigger push in Arizona to get drivers off the road and into the repair shop. Lim said the monsoon, the mix of hot and humid temperatures, can pose more risk for injury or death. "That's...unfortunately, the combination of heat and humidity that these inflators need to become very volatile," Lim explained.